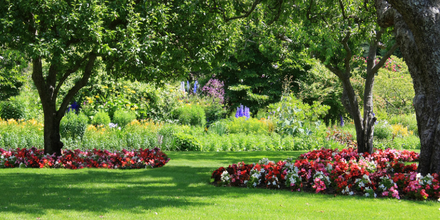 Is your lawn not looking its best due to lack of sunlight? In most cases every garden has at least a little shade, however it’s very common for this shade to damage the growth of grass on your lawn. along with lawns which are in shade are more likely to become damaged damage by a lack of sunlight. With sun blockers like large trees, walls or buildings stopping the rays of sun reaching your lawn, the grass finds it difficult to flourish. Which makes choosing the best grass seed for your shaded lawn really important. We The Grass People understand lawn care can be tough when you have difficult growing conditions. We have developed two easy to use seed mixtures, STEADFAST: Shade & SUPER STEADFAST: Ultra Shade. Creating these mixtures after careful research and testing of grass lawns in shaded conditions and we have found the perfect selection of grass varieties, which have been added both mixtures, that are incredibly shade tolerant. When used appropriately both of our shaded lawn mixtures rejuvenate shade damaged grass to luscious and vibrantly green grass. STEADFAST grass seed is designed to grow in shaded areas of lawns, particularly those damaged by garden trees or dappled areas of your garden’s grass. STEADFAST is a hardwearing grass seed mixture which boasts magnificent results in repairing your lawn. · Perennial Ryegrass (15%): This grass seed species offers excellent lawn shade tolerance. It has a dark, rich green colour, and is particularly well known as a companion grass which mixes well with many other grass types. · Strong Creeping Fescue (35%): Has a high shoot density, relatively slow growth and has very fine needle like leaves. It thrives under a wide range of conditions in particular light restricted soils such as shaded lawns. · Smooth Stalked Meadow grass (10%): Known in America as Kentucky Bluegrass. This species is an extremely hardwearing with excellent repair capabilities to bring your shade damage lawn back to life. It also makes a denser turf than fescue so it is a useful addition to shade mixtures. · Hard Fescue (40%): Noted for being particularly low maintenance and offers a particularly upright growth habit. It is also grows in poor soil conditions along with areas of low shade. SUPER STEADFAST Ultra Shade grass seed is perfect for garden and lawns with very low exposure to sun light. SUPER STEADFAST Ultra Shade is a specially blended lawn seed mixture, which has been developed to rescue grass lawns damaged by wall or high fence shade. Our grass seed mixture contains the exceptionally shade tolerant grass species Poa Supina which when sown in May can germinate best results due to the soil being warm. · Smooth Stalked Meadow grass (40%) is also known Kentucky Bluegrass in America. This species is an extremely has excellent repair capabilities. It has the advantage of making a denser turf than fescue so it is a useful addition to shade mixtures. · Hard Fescue (50%) is noted for being particularly low maintenance & offers a particularly upright growth habit. Hard Fescue is known to grow very well in poor soil conditions along with areas of low shade, such as lawn shaded areas. · Poa Supina (10%) is an exceptionally shade tolerant species which is quite expensive however is known to have "grown where no grass has grown before". It’s resistance to soil disease and aggressive growth make it for heavily shaded or damaged areas of your lawn. Find out how to sow grass seed.